It’s that time of year; everywhere you look, virtually every retailer - if not already doing so - will start to promote a special discount or promotional deal for this year’s Black Friday sales event. During the coming weeks before and after Thanksgiving, retailers will be aggressively promoting their deals and promotions to lure consumers to purchase their products and or services. 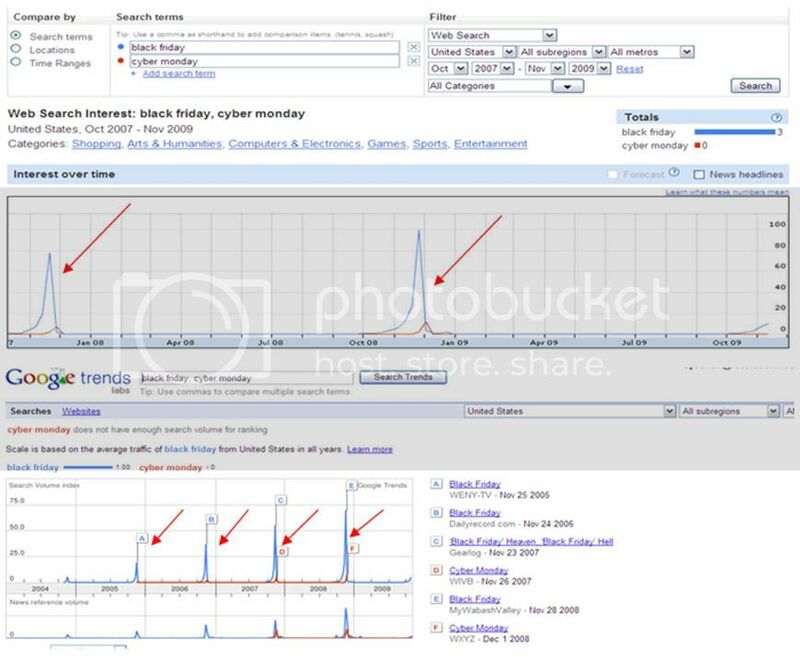 Both Black Friday and Cyber Monday are two of the most significant online shopping days of the year. Retailers depend on both days to generate a large majority of their revenue, investing thousands of dollars in marketing in order to expose their products to consumers. 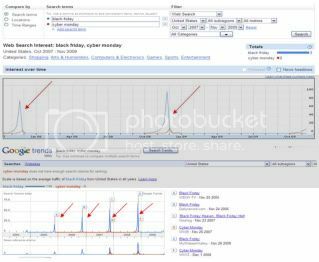 Below you’ll find two screen shots representing the drastic search demand spikes during the month of November. Click to view smaller image. While previous years have generated growth across various verticals this year our nation is trying to recover from an economic crisis. The National Retailer Federation has projected that this year’s holiday season sales in the US are likely to drop 1%, which is actually an improvement from 2008’s decline of 3.4%. Nevertheless, consumers will not only be shopping cautiously for the best deals but also for gifts that are necessities rather than luxury items. Review your ad copy and keywords. Look into messaging that calls out deals or specials. This holiday season, consumers will be cautiously browsing for the best deals, which is no surprise considering the economic situation thousands of Americans are faced with this year. Search engine marketers should also be monitoring the messaging of competitors and try to distinguish their offering as the better choice by incorporating messages that call out available deals or holiday specials. Offer incentives for consumers such as: free shipping, sales, coupons, deals, and a certain percentage or dollar amount off their product or service. Consumers are expected to shop conservatively this year, but that does not mean that you will have an unsuccessful holiday program - start displaying messaging early on that call out deals that are appealing and hard to pass up. Shoppers will be looking around for what they deem the better deal, so start planning your upcoming holiday season strategies now for a successful holiday program!